Greece booked their place at the 2014 World Cup with a 1-1 draw in Romania to complete a 4-2 aggregate play-off win. 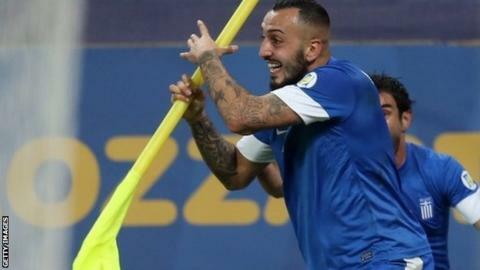 Leading 3-1 from the first leg, the Greeks soaked up some early pressure before Konstantinos Mitroglou beat the offside trap to put them ahead. Romania were gifted a bizarre equaliser after the break when Greece defender Jose Holebas's clearance hit Vasilios Torosidis and span into the net. But Greece saw out the rest of the game to ensure they will be going to Brazil. Romania's wait to qualify for their first World Cup since 1998 goes on, but Greece are through to their second successive finals, and their third in total. Fernando Santos's side will head to South America in confident mood - they have now won 18 of their last 24 games and their progress was never seriously in doubt in Bucharest. Romania, roared on by 50,000 fans at the National Arena, began brightly enough and Gabriel Torje was a menace down their right flank, but Greece remained dangerous on the break. Home keeper Ciprian Tatarusanu had already denied Holebas before Olympiakos striker Mitroglou, who scored twice in the first leg on Friday, ran clear to slot home his third goal of the tie. Romania struggled to turn their superior possession into chances but were given hope after 55 minutes thanks to the mix-up between Holebas and Torosidis on the edge of their own area. That triggered Romania's best spell of the night, but a finish of their own continued to elude them. For all their possession, Ovidiu Hoban's low drive was the only time they seriously tested Greece keeper Orestis Karnezis in the closing stages and the visitors appeared comfortable long before the final whistle. "I thank God and I thank the players who were fantastic. We are going to Brazil and that's amazing. "I think it is a great thing for Greece that we are going to our second consecutive World Cup. And certainly this is a huge moment for me, personally." Match ends, Romania 1, Greece 1. Second Half ends, Romania 1, Greece 1. Corner, Romania. Conceded by Loukas Vyntra. Cristian Tanase (Romania) wins a free kick in the defensive half. Foul by Georgios Samaras (Greece). Georgios Samaras (Greece) wins a free kick on the left wing. Dorin Goian (Romania) wins a free kick in the defensive half. Foul by Giannis Maniatis (Greece). Corner, Greece. Conceded by Gheorghe Grozav. Alexandros Tziolis (Greece) is shown the yellow card. Alexandros Tziolis (Greece) wins a free kick in the defensive half. Substitution, Romania. Gheorghe Grozav replaces Bogdan Stancu. Offside, Romania. Marius Niculae tries a through ball, but Alexandru Maxim is caught offside. Attempt saved. Bogdan Stancu (Romania) right footed shot from the left side of the box is saved in the bottom left corner. Assisted by Ovidiu Hoban. Foul by Ciprian Marica (Romania). Orestis Karnezis (Greece) wins a free kick in the defensive half. Corner, Romania. Conceded by Andreas Samaris. Substitution, Greece. Kostas Manolas replaces Dimitrios Siovas because of an injury. Delay in match Dimitrios Siovas (Greece) because of an injury. Attempt missed. Marius Niculae (Romania) left footed shot from outside the box is high and wide to the left. Assisted by Ovidiu Hoban. Corner, Romania. Conceded by Georgios Samaras. Ovidiu Hoban (Romania) wins a free kick on the left wing. Foul by Andreas Samaris (Greece). Substitution, Greece. Andreas Samaris replaces Giorgos Karagounis. Substitution, Greece. Loukas Vyntra replaces Vasilis Torosidis. Hand ball by Konstantinos Mitroglou (Greece). Offside, Romania. Alexandru Maxim tries a through ball, but Ovidiu Hoban is caught offside. Georgios Samaras (Greece) wins a free kick in the defensive half. Attempt missed. Iasmin Latovlevici (Romania) left footed shot from outside the box is too high from a direct free kick. Cristian Tanase (Romania) wins a free kick in the attacking half. Attempt blocked. Cristian Tanase (Romania) right footed shot from outside the box is blocked. Assisted by Alexandru Maxim. Offside, Greece. Dimitrios Salpingidis tries a through ball, but Konstantinos Mitroglou is caught offside. Corner, Romania. Conceded by Orestis Karnezis.